Everyone here at NWA Tri-State would like to send our deepest sympathies to commissioner David Powers, who recently lost his mother. We ask all fans to keep the Powers family in your thoughts and prayers. FORMER NWA WORLD TITLE HOLDERS UNITE IN WELLSTON! 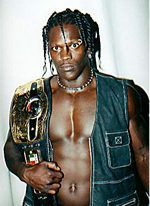 Former NWA World Heavyweight champ Ron "The Truth" Killings and former NWA World Junior Heavyweight champion Rocky Reynolds only wanted to go head-to-head in a match of former champs in Wellston, Ohio on April 12. Both got more than they bargained for, and in the end formed an alliance in order to survive the evening. Click on "RESULTS" to read about this and other events from the evening. Trik Nasty (seen here with the lovely Erin) bested Rocky Reynolds and Max Power to win the NWA Tri-State Heavyweight championship on April 5 in Parkersburg, WV. Also, Shawn Parks made the first defense of his newly won U.S. championship. A complete recap of the night's events will be available in the results section. reused without authorization from NWA Tri-State.